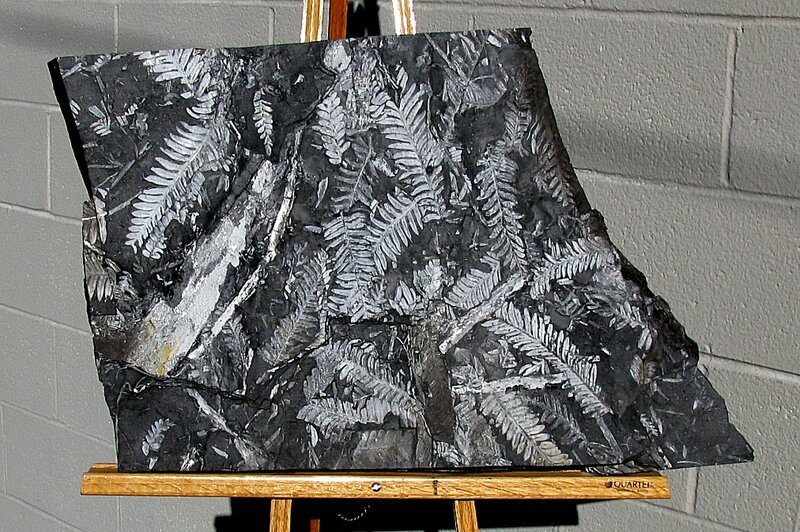 This is a huge plate of fossil seed ferns from the Coal Age deposits near St. Clair, Pennsylvania. It is very hard to get a slab this large from this site, let alone a slab of this size that is this nice! The entire slab is covered with large seed fern fronds and branches. There are several different types of seed ferns preserved, and there are even some other fossil plants displayed on the plate. The distinct ferns are preserved as a thin film of white pyrophyllite on black shale - quite striking! The fossil plants have beautiful color and contrast and exhibit superb detail. And this whole slab (almost a full TWO feet across!) is one piece - it has never been broken or composited together! This is a huge, top quality display plate of Pennsylvanian plants from a classic location - simply amazing!